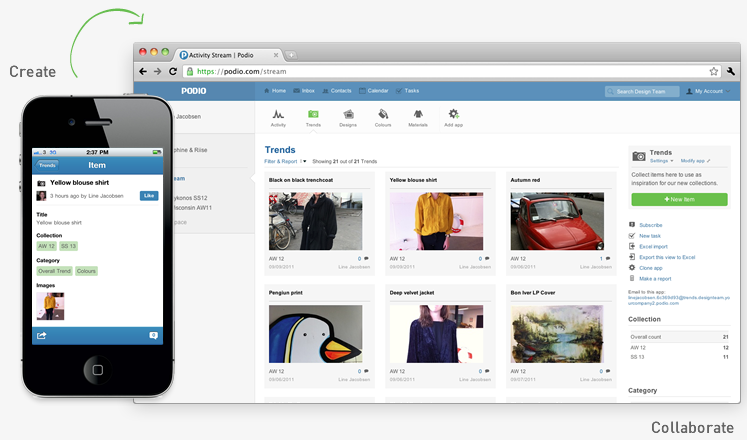 Online work collaboration tool Podio has a unique selling point of offering users the ability to create their own apps to carry out specific tasks. Now it has rolled out the ability to bring those apps to the mobile realm by way of an update to its iPhone app. Podio says that since its launch in March, over 200,000 apps have been created by users. These have been used to manage sales leads; execute projects; deliver software, recruit talent and more. Now that the apps are mobile, it means that members of teams using Podio can operate the apps on the go, adding extra flexibility to the platform. We first introduced you to Podio in September last year, when we described it as “A game-changing virtual office that forms to your needs.” More recently, the company added Web-based forms that users can set up to feed data into their self-created apps. While Denmark and San Francisco-based Podio operates in a highly competitive market, with rivals such as Yammer, Socialcast and Convofy, its ‘apps’ concept certainly offers something a little different. I should note that Podio is flying me to Copenhagen later this week to meet members of the local startup community. That didn’t affect my decision to publish this news, and it is certain to make an interesting story here on The Next Web soon, as we explore what the Danish capital has to offer Europe’s tech scene.